A SpaceX Falcon 9 rocket launches the Zuma mission for the U.S. government agency on Jan. 7, 2018, from Florida's Cape Canaveral Air Force Station. The mysterious payload, built by Northrop Grumman, never reached orbit. 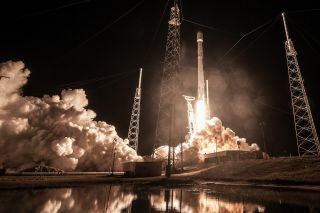 SpaceX isn't responsible for the loss of the top-secret Zuma spy satellite during the craft's launch earlier this year, according to media reports. On Jan. 7, Zuma lifted off atop a two-stage SpaceX Falcon 9 rocket, kicking off a hush-hush mission for the U.S. government. This mission was to be so hush-hush, in fact, that officials wouldn't even confirm which government agency would operate Zuma, let alone what exactly the craft would do in Earth orbit. The speculation then turned to what exactly had gone wrong. SpaceX& insisted from the beginning that the Falcon 9 performed normally during the flight — a claim that has apparently been borne out, The Wall Street Journal (WSJ) reported on Sunday (April 8). Two different teams of government and aerospace-industry experts have concluded, albeit tentatively, that the problem arose with the "payload adapter" that connected Zuma to the Falcon 9's second stage, according to the WSJ story (which you need a subscription to read). The aerospace company Northrop Grumman built Zuma for the U.S. government and provided the payload adapter for the flight. "The device, purchased from a subcontractor, was significantly modified and then successfully tested three times on the ground by Northrop Grumman, according to one person familiar with the process," the WSJ reported. "But upon reaching orbit, this person said, the adapter didn't uncouple the satellite from the rocket in zero-gravity conditions." These modifications to the adapter were apparently performed in an effort to reduce vibrations during spacecraft separation, because Zuma's unique design rendered it potentially susceptible to jolt-induced damage, the WSJ further reported, citing unnamed analysts. These analysts suggested that Zuma may have been a missile-warning satellite or some other type of advanced-radar spacecraft. As the WSJ story noted, the Zuma findings are another bit of bad news for Northrop Grumman. The company is the prime contractor for NASA's $8.8 billion James Webb Space Telescope, the highly anticipated successor to the agency's Hubble Space Telescope. Webb has experienced significant cost overruns and delays; just two weeks ago, in fact, NASA announced it was pushing the observatory's launch back again, from 2019 to May 2020 at the earliest. NASA officials cited the need to perform more testing, as well as several problems with some of Webb's intricate systems, including some tiny tears in the telescope's huge sun shield. Agency personnel will begin stricter oversight of the Webb project at Northrop Grumman facilities, NASA officials said.